One Day After TI Promises To STOP CHEATING . . . Photo'd Out With Alleged SIDE CHICK!! MTO News confirmed that TI and Tiny are trying to work through their marital issues, and that the couple plans on RENEWING THEIR VOWS this fall. The couple is working with VH1 to have their marriage renewal special aired ton television. MTO News also confirmed that TI has promised Tiny "no more cheating." Well he was at a party this weekend, with the woman that many are accusing was his alleged side chick. Asiah Pearson. Last month a video surfaced showing TI groping a lite skinned beauty. 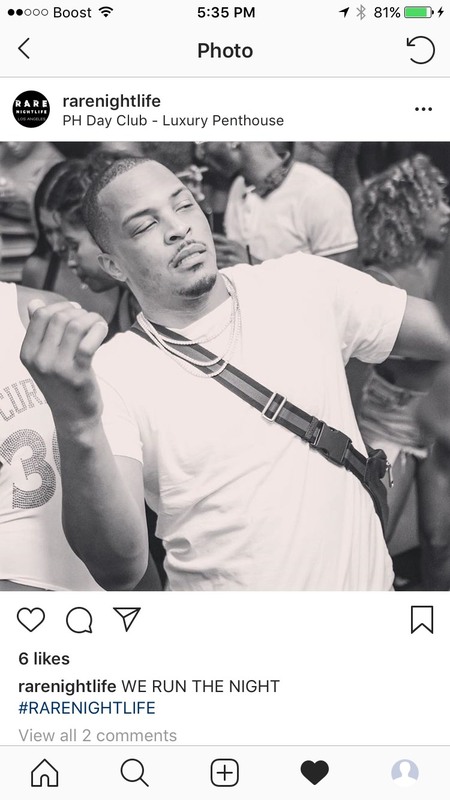 Folks on social media speculated that the woman being groped in the video, was actress Asiah Pearson..
Well Asiah and TI were at the club together on Saturday. And while it may have just been a coincidence, the image clearly shows Asiah dancing near TI. So far Tiny has NOT commented on this pic. And just in case you need further RECEIPTS proving that&apos;s her. Recently according to Page Six, on Bravo’s new show “Kandi Koated Nights” — hosted by “Real Housewives of Atlanta” star Kandi Burruss — Tiny revealed she’s hired a private investigator to follow her husband, rapper T.I. Harris took matters into her own hands when she suspected T.I. of cheating with several women. T.I. has six children, and the couple have three together.